Fans of Lawrence Block have waited a long time for a new, stand-alone novel. None of Block's series characters--Bernie Rhodenbarr,Matthew Scudder, or Keller--appear anywhere in the pages of Small Town [2003, Harper Torch-HarperCollins Publishers, NY,NY]. No witty buglarish comedy, then, no alcoholic (post- or otherwise) sleuthing, and no murders-for-hire awaits readers here. Instead, we are rewarded with an intriguing mixture of boldly-drawn characters who eventually disturb each other's orbits in the vast solar-system of the Big Apple. Fans of Lawrence Block know to expect the unexpected from his fully-fleshed villains and heroes. This novel's motley crew of flawed good-guys and sympathetic bad-guys certainly will not disappoint faithful readers. Might shock them, though. Small Town won't be featured anytime soon in the local library's Books Read Out Loud program. This one's strictly for mature adults. Small Town builds its post-9-11 story one piece at a time, as Block introduces each character with revealing morsels and a smidgen of background. First we meet Jerry Pankow, an unassuming gay man who pays the rent by cleaning two bars and a brothel. He also picks up spare cash by tidying-up for a few clients he's acquired by word-of-mouth. One of them, lovely Marilyn Fairchild, turns up dead. Her death leads us to an acquaintance of the deceased: Susan Pomerance. She's the owner of a successful folk-art gallery, and she's looking for love in a whole lot of places. Perhaps the death of her one-time friend compels her to live life with a bit more gusto. Susan introduces us to her favorite attorney and some-time lover, Maury Winters. More on Maury shortly. We're drawn, next, deep into the lives of two very dissimilar heroes: a struggling writer and a "retired" top-cop. The writer, John Blair Creighton, might have murdered the bar-cleaner's client--even he isn't completely certain of his own innocence. Fortunately for Creighton, his lawyer is the afore-mentioned Maury Winters, one very capable defense attorney. Meanwhile, the cop, former NYC Police Commissioner Francis Buckram, finds himself intrigued with the circumstances surrounding the first murder. (Oh, yes, there are many more murders along the way!) He finds himself even more intrigued with the gallery owner, Susan, who's busy discovering the power of love. Susan immerses herself in the lives of an entire collage of characters, some of them central to the story--some not. It's all fun to watch, at any rate. As more people die, the circumstances seem to implicate the cleaning guy, Pankow. We know he didn't do it, since we know who the real killer is, and we know why. (No, I won't tell you his name here.) We can even sympathize to an extent, although this poor fellow's methods are rather disturbing. Meanwhile, the writer and his attorney must fend off an over-eager pair of detectives who, at first, feel sure the writer is the killer. Murder charges lead to amazing developments for John Creighton, the struggling novelist. The writer's notoriety ropes in Miss Susan, who knows the policeman, who's pretty sure the author is innocent. One of Susan's other "friends" tells her a story that eventually exposes the true killer, after a few more gruesome twists in the plot. And I haven't told you the half of it all! I'm sure there have been hundreds of novels written since the fall of the Twin Towers. With nearly three thousand souls lost among four related disasters, there is an endless supply of stories to tell. Small Town is entirely fictional, however. This isn't Readers' Digest "Drama in Real Life." Instead, Block treats us to a mostly irreverent human drama. Don't read this tale expecting heart-wrenching descriptions of selfless heroism. Read it for the joy of a rambling and ambitious plot piloted by a wild and unlikely crew. If, in the end, the whole concoction offends your sensibilities--well, there's always next month's Readers' Digest. For all the rest of us, we can only wait for Block's next endeavor. We might be surprised, but we won't be disappointed. --Highly recommended: 4 stars (of five). What's the buzz? "Summer's over..."
For me, the highlight of every summer is the opportunity to go camping. 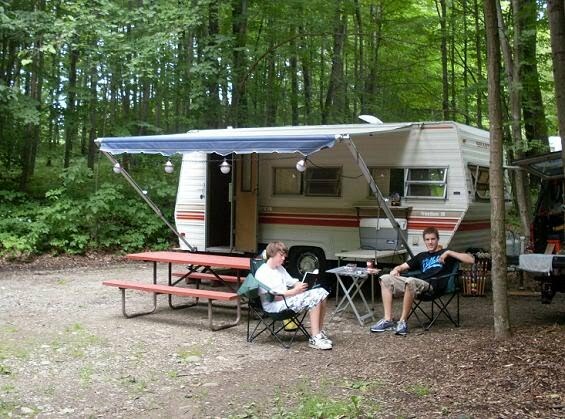 We used to endure the tenting ordeal; but last year we finally upgraded to an aging but very accommodating travel trailer. We've kept one favorite tradition from our tenting days, though: judging the quality of the night for camping. It doesn't matter so much anymore, this question of whether or not the night is "a perfect camping night." The decision remains, however, if only to note the weather and acknowledge those precious few ideal days. This year we counted (and lost count in the process) more than fifty "perfect camping nights." 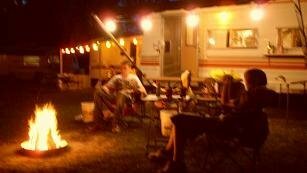 Most of the nights which actually fell during times spent in our newly-acquired camper failed to qualify, which is only to be expected. No matter, really, because I honestly love the sound of a warm summer rain on a metal roof. Talk about a perfect night's sleep! Summer's nearly over now, though; and the camper sits lonely in the driveway waiting for the day when I'll admit there will be no more camping this year. I'll move the trailer off the pavement and into its winter spot by the garage, to make room for the inevitable snowplowing piles. There remain fewer than a handful of official summer days, by the calendar. Tonight, however, just happens to be a perfect camping night. This, despite the fact that the weather since Labor Day has been just a nuance short of dismal. I made a point to notice the quality of this nearly-fall evening--even though I stopped keeping score a couple weeks ago. I had to say the incantation aloud: "It's a perfect camping night." How can you tell the perfect ones from the not-so-perfect? There's more to it than a lack of rain, of course. For one thing, the temperature has to be over sixty. Even though the camper has its nifty little furnace, I really hate the need to turn the thing on. A perfect camping night, in order to be included in the tally, has to be that quintessential summer evening. Not even a whisper of a breeze in the air. No lingering mist of rain or drizzle. At least a slice of the moon. But most of all, you have to have the sound of uncountable tiny night critters. That's the clincher. When all the conditions are just right, the symphony of the nighttime insects is so pure that you'd swear it was straight off the soundtrack of a movie. It's a sound that tells you, without any other clues at all, that this is one of those nights. For the final half of summer, however, we've endured a strange intrusion on those otherwise impeccable evenings. We've had a visitor: a creature so vocal that it drowns out the sweet melodies produced by all the rest of the nocturnal orchestra. He's a cicada--what some folks would label a "locust." ("Locusts" are actually giant, swarming grasshoppers. Different critter all-together.) You won't often see one up close, except when you find an abandoned husk of crispy shell left behind in shedding. Alive and well, a cicada stays out of sight high in a tree. His grayish body (nearly as large as your little finger!) blends beautifully with tree bark. I haven't seen our border, but he's kept to the same tree for weeks now. He talks to us whenever the night is right. He's capable of making a sustained sound louder than anything you or I could produce from our ordinary vocal chords. There's nothing musical about his song, either. It's similar to the sound you hear when you pass too close to an electrical substation. Usually, there would be at least two or three of these insects singing. When they perform together their shrill buzzing becomes an almost super-sonic background for the rest of the bugs. But when one of these screeching beasts decides to go solo he overwhelms the whole show. Our personal cicada has been auditioning every night for at least the past month. I mentioned he talks to us, and that's exactly how it seems. His sentence is three identical words, sounding a bit like reeeet reeeet reeeet. The pitch and cadence is always the same; but he sometimes drops the third word. Mostly, though, it's three beats-pause, three beats-pause. For hours. He never tires. And the longer he talks, the less often he inserts the two-beat version. He's never disturbed or discouraged by anything we do: lights on or off, clapping or whistling. Doesn't matter; it's reeeet reeeet reeeet all evening and well past bedtime. He's a pest, and he spoils the idyllic sounds from all the rest of the nightime singers. I'm done complaining, though. Listening to my invisible bug-friend carrying-on from his treetop hiding place, I'm reassured that summer is still with us. It's another perfect camping night; not the last, I hope. Soon enough the air will turn cooler and our personal evening soloist will go wherever big bugs go for the winter. Gone, too, will be the rest of the band: the crickets, grasshoppers, frogs, toads, and whatever else lives out there making summer music. After a brief, brilliant display of crystal-clear chilly nights and dazzling daylight leaf displays the only sound in the ever-earlier darkness will come from the north wind moving in. I'll sure miss that reeeet reeeet reeeet when that time comes--until spring returns and the cicada with it. I'm sure he'll be back. It's been months since I've visited my own place. Oh, I've been busy! We moved! We bought a house, spent half the summer weekends camping, reconstructed an entire front garden, and sent a daughter off to college. Installed some cabinets, wired some circuits, cleaned-out our new garage. And worked! Kitchens, baths, shower-doors--no rest for the weary a-tall. Excuses, all. So I'm back now, in my own little space. This is just my toe, wedged into the doorway. I see dusty furniture here, cobwebs, and smell musty air. Time to open a few windows, pull the covers off the sofa and chairs, spread some fresh sheets on the bed, and light a candle or two. I haven't decided yet what approach I'll take to this section of my Blog-world. I have some many new avenues to explore here. We have broadband now: like jumping off an old steam locomotive and into a first-class seat on the new Airbus! I've discovered the amazing world of instant access to brand new music and videos. (Yup, I even have rubber tires on my steam tractor, too!) I left the crowded land of Amazon.com (temporarily) to the bright green pastures of Paperback Swap--five stars and my complete endorsement there. I liked to talk about music before, and I've been reading since I could talk (just about, anyway); so those are two interests I'm sure to continue writing about here. I'd like to include some more "comedy," or musings? I do enjoy spouting off my personal opinions, too. (Who doesn't?) So I'll probably keep that going, as well. The most important part of writing, be it Blog or whatever medium, is just to DO IT! (Thanks for that, Nike ad guys and girls!) So I'll do it. One way or another. As my friend John pointed out, just the other day, our minds are always thinking about stuff. It's good to write any of that "stuff" down sometimes. Before our aging, seive-like minds forget. And so I will. Write. Stuff, down. It's good for the soul. And bloody good exercise for the fingers, too! Onward from there... --Jim, Sept 14, 2006.